In Dakar, Fatou Bintou Sagnang, MBA 2015, liked to look to the heavens with her father, who hoped his children would be able to fulfill ambitions in aerospace that were beyond his reach. Fatou, who came to the United States in 2001, found herself in a country where she could make that reach-and could do the aerospace research she once only dreamed about. "I grew up developing a love for space and astrophysics, airplanes, anything that flies really," Fatou says. But after two years of research at Princeton University, her ambitions evolved. "I felt that I not only wanted to do something that impacts people, but also draws me close to people. I just didn't see myself being in a lab all the time. I wanted to interact—business was a way for me to get to that." After three and a half years with Advanced Technology Investment Company in Abu Dhabi and two years with McKinsey, Fatou's enthusiasm for business grew, and with it, the desire to learn how to make herself more effective. 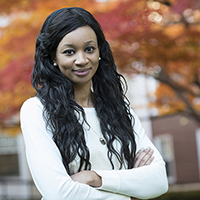 "For me," Fatou explains, "coming to business school is about connecting the dots—getting the macro perspective on how business works and how the world hangs together, then bringing it down to the corporate and personal levels." She references a case study about a young HBS graduate who assumes an executive position, bringing analytical skills more mature than his leadership abilities. "It hit home for me," says Fatou, “because I think that to jump to the next level, you need a broader perspective on how to move forward, one that anticipates what other stakeholders are thinking and is able to involve them. I think making that jump is probably the hardest you'll make in your career." To get to HBS, Fatou had to make a considerable leap of her own. While she advises others "not to put too much on their plates," life had already given her quite a buffet: Three weeks before she arrived on campus, Fatou gave birth to her first son, Ahmed. Fatou's husband continues to pursue his own business career in Africa, while Fatou's mother is on campus to help Fatou with her son. As a consequence, Fatou's schedule looks very different from most other MBA candidates; after classes, she resumes care of Ahmed, then rises at 3 or 4am to tackle her cases. "There's that concept of FOMO that people always talk about, and I experienced it here for the first couple of months," Fatou says. "But I sat down and told myself, you know what, I can't do everything. But I can focus on the few things I really have to do and do them well. And I was at peace with that." Fatou's inability to participate in all of the social events that she would like to has not prevented her from having a rich social life. "The incredible thing is, I've developed very deep relationships anyway. It's been tough, but I've made friends who have embedded themselves in my very unusual situation."